Today United Launch Alliance (ULA) and Blue Origin announced a new liquid oxygen, liquefied natural gas (LNG) rocket engine that delivers 550,000-lbf of thrust at sea level. 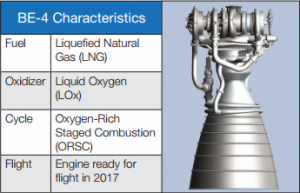 The engine has been in development at Blue Origin for three years and a pair of them will be integrated into the Atlas rocket in appropriately three/four years. The upgraded rocket will have 1.1m lbf thrust giving it a boost over the single RD-180 engine design currently used. The engine will be jointly funded by ULA and Blue Origin, the BE-4 was selected because of the progress that had already been made developing the engine. One natural question that comes out of this is what will the impact on SpaceX? Basically in the short-term this will not have much impact as SpaceX have a large manifest of orders on the books and just recently added nine more including potentially three Falcon Heavy launches. Plus the engine isn’t scheduled to be ready for three/four years so ULA will still be using RD-180 until then. Longer term we don’t believe it will have much of an impact either, once it has been integrated to Atlas they will have to have at least three flights to re-certify for any Air Force launches and also prove the new system is as reliable as what they have today before customers will commit, and finally they will have to reduce there prices to really have an impact on SpaceX. If anything this could actually benefit SpaceX as they will have three/four more years of proven flights behind them and may also be closer to completing their new Raptor engine which has significantly more thrust than BE-4. Following the announcement they held a Q&A session below are some of the questions that were found on twitter. Bruno was asked if BE-4 or Blue Origin engines were mentioned in the Boeing commercial crew proposal: answer No.